Lynx attract for her - This was my go to shower gel once it was released, I get the gift sets every year for Christmas and my birthday. It doesn't smell too feminine but isn't too masculine either therefore it is perfect for me. I aren't too sure if anyone has got me this for Christmas as I have moved onto the Lynx you lately, but I honestly would buy this over and over again. 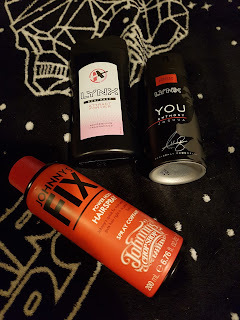 Johnny's chop shop fix - This hairspray has easily become a staple product in my hair routine. It gives a great hold even in this wonderful Yorkshire weather. I don't even need to top it up during the day. At £5 it can seem a little pricey but in my opinion it is worth it due to the hold it gives. I don't think I will buy any other hairspray for as long as this is available. Lynx you - You can read my review of this spray here. I think this is going to be my go to spray for as long as it is around. The scent is great and a little really does go along way. If you can get it whilst it is on offer too it is such great value for money. I may even start to get this in the XL cans. Did you use up any items in November? If so what did you use up?